Blue collet necklace in a gold mount. Photo by Duchessa Jewels. My friend Nerida at Art for Interiors has recently launched Duchessa Jewels to sell the gorgeous jewelry she designs. From Nerida I learned that the gemstone necklaces I admire on Anna Wintour are collet necklaces, a style popular in the Georgian era—referring to the years 1714-1830 when the kings George I through IV ruled England (with a Regency thrown in for fun, from 1811-1820). She’s also taught me about the jewelry owned by the Duchess of Windsor. What I love about Nerida is that she has taken her passion for famous and historical jewelry and figured out a way to recreate it so you can have some of that glamour in your life without being the editor of a famous magazine or a woman married to a former king. My mother bought one of Nerida’s topaz collet necklaces a year ago and I love to see it (and yes, put it on, see below) every chance I get. She recently purchased the blue necklace shown above which I hope she will let me borrow for Date Night the next time I’m in Virginia. Wearing the topaz collet necklace, December 2010. Anna at the Alexander McQueen Spring/Summer 2012 show on October 3, 2011. Photo by Pascal Le Segretain/Getty Images Europe. And then add some sunglasses and a wild trench! Anna attending the Louis Vuitton Spring/Summer 2012 show on October 5, 2011. Photo by Bauer Griffin. Do stop by Duchessa Jewels and have a look at Nerida’s beautiful designs such as the above bib necklace, based on the Duchess of Windsor’s stunning 1947 Cartier bib necklace. 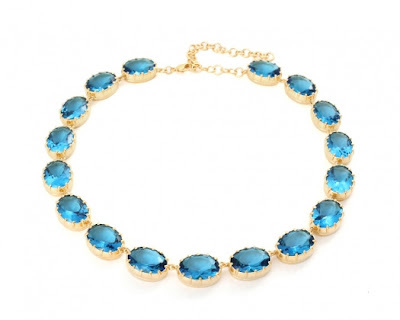 I love the topaz necklace - it's so beautiful and so wearable too! How did she order it? That style has been sold out for at least a month? I've been checking regularly. All so beautiful and chic....I love, love the bib necklace for its unique qualities...a true statement necklace!! Gorgeous necklaces, they don't seem that expensive. Wish they were available in the UK. I often wear 2 strings of pearls together they look more important. Wow, those gems are in gorgeous settings too! And just love anna's trench--that's one that I would LOVE! Hi, Jill! I still love those Anna Wintour-esque necklaces, which I remember from your entry last year. You deserve one for yourself! Thinking of you as I eye Savage Beauty atop my bookcase -- the big Alexander McQueen book published for the exhibition. My parents-in-law did go to the exhibition last year, and loved it, and lent me the book last weekend. I need to find a time when I have some energy and peace, without small kids, yogurt, and juice boxes everywhere. Wow! what gorgeous pieces; the intensity of the colors are stunning. Of course you may borrow either or both for date night!